Nanalulu's Musings: Did You See In Martha Stewarts HOLIDAY Magazine?? Did You See In Martha Stewarts HOLIDAY Magazine?? 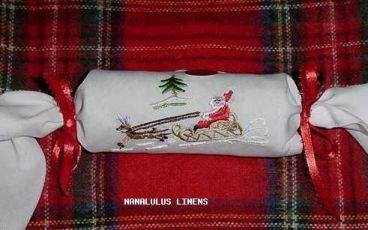 About Using Vintage Hankies As Gift Wrapping? Isn't that a great idea? Well not one I haven't thought of myself actually! 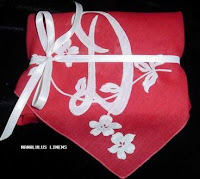 Need vintage handkerchiefs, be sure to visit http://www.nanaluluslinensandhandkerchiefs.com/ for the best selection you will find anywhere on the web. What Can You Do With Vintage Handkerchiefs? 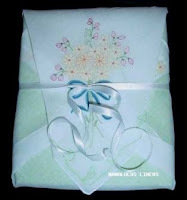 However, if you don't win, and are still interested in sharing greetings this season...I'd love to have you take a peek at my site and view my 2008 line. You can access the link at www.graphici.blogspot.com. I had a new baby girl 3 weeks ago, so I'm offering pre-designed templates in lieu of doing custom designs [as I've limited myself to in the past]. Because of this, you can get 50 cards for ONLY $40! !